A daub of peanut butter helped to create a moment between Christian Ponder and Dallas in Tallahassee, Florida. 1/250 sec f/8 at ISO 400. Tallahassee magazine was doing a story on the local animal shelter – the Tallahassee-Leon County Animal Service Center – which was recently awarded $25,000 from the American Society for the Prevention of Cruelty to Animals for inspiring the community and adopting out 1,200 animals in 90 days. 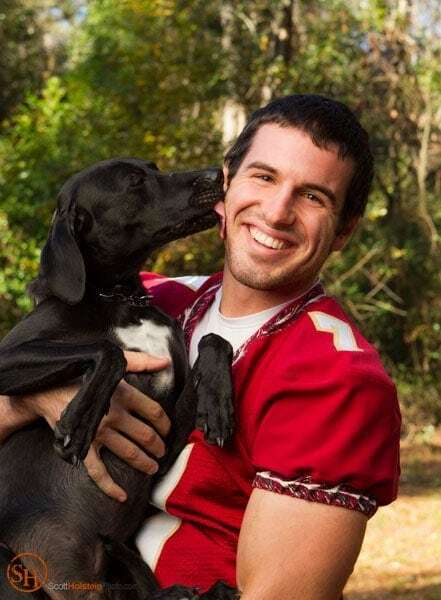 As it turns out, local celebrity Christian Ponder, star quarterback for the Florida State University Seminoles football team, had recently adopted a dog from the shelter. So a couple of days before his last game in his college career, I photographed Ponder in Tallahassee with Dallas, his black Labrador Retriever. Lighting for this portrait was simple; I placed Ponder in the shade of a tree in his back yard and lit him with a Profoto 7b strobe in a 5’ Octa softbox. Since Dallas is black and will act as a light sponge, the flash is on his side of Ponder. The background greenery is lit with dappled sunlight. To get Dallas to lick Ponder’s face and create a decisive moment in the image, I put a daub of peanut butter on Ponder’s cheek. Update: Ponder has since been drafted by the Minnesota Vikings to play in the NFL. I love the expression on the face. Showing this picture to my Lighting and Portraits class. As a Viking fan, I hope he does well in the pros too.